Despite a lively snowstorm, enthusiastic supporters of Santa Fe Mayor David Coss gathered en mass this past Sunday to rally for his re-election at the Elks Lodge in Santa Fe. The already festive gathering was energized further by the featured speakers -- famed labor and justice advocate Dolores Huerta and U.S. Rep. Ben Ray Lujan (NM-03). Great eats were provided by Bert's Taqueria. The good vibes were courtesy of the Mayor's spirited allies from all walks of life. Notables in the crowd included New Mexico House Speaker and his wife Carmen, Secretary of State Mary Herrera, Santa Fe State Rep. Brian Egolf, Carter Bundy of AFSCME, Christine Trujillo of the American Federation of Teachers of New Mexico, Santa Fe County Sheriff Greg Solano and many others. It was a particular honor to have Dolores Huerta at the rally. In fact, Mayor Cos said it was "one of the greatest honors of my life that she'd come out here today for us." She doesn't do this for just anybody. Huerta pointed out her long-standing ties to New Mexico and the state's special brand of politics, explaining she was born Dolores Hernandez in the coal-mining town of Dawson, New Mexico. She said her father was a union organizer and state assemblyman, and that there are a couple New Mexico judges among her ancestors. As for her support for Mayor Cosss, she said, "There's only one litmus test in judging political figures. You're either for the working people or you're not. And Mayor Coss is definitely for the working people." While political rallies in New Mexico are always fun, the main goal of this event serious indeed -- to encourage people to get out and vote in the municipal election on Tuesday, March 2, 2010, and to urge them to work with the Coss campaign to get out the vote on election day. (Early voting at the city clerk's office continues through Friday.) Mayor Coss has the lead in the race, according to recent polling, but his victory depends on people voting, and getting their friends, families, colleagues and neighbors to do the same. We can lose this election if turnout is low, as it has been in other places of late, like Massachusetts. We can't let that happen here. So get involved NOW. Donate your time and/or financial support to the Re-Elect Coss campaign. Most of all, help GOTV on March 2nd. 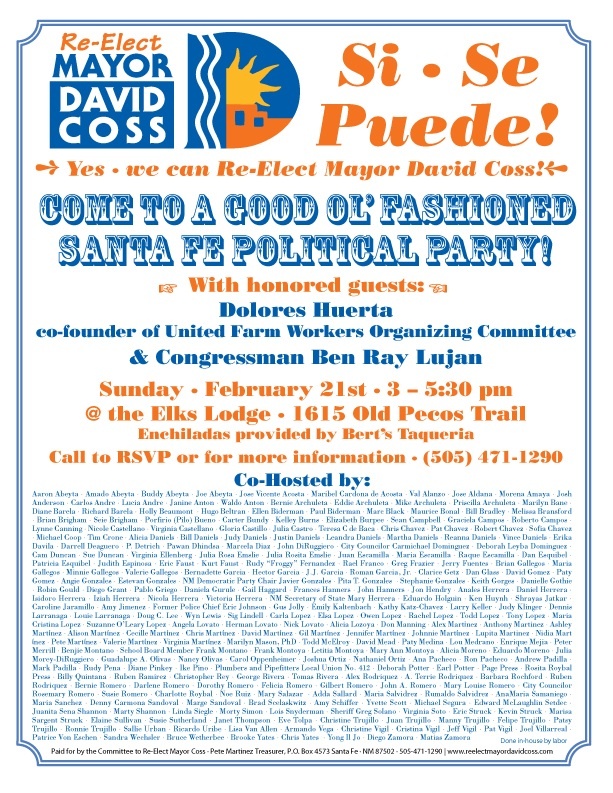 Join Delores Huerta, Congressman Ben Ray Luján and many more at today's rally to support the re-election campaign of Santa Fe Mayor David Coss. All are welcome at the Elks Lodge, 1615 Old Pecos Trail in Santa Fe, from 3:00 to 5:30 PM. Enchiladas provided by Bert's Taqueria. Call to RSVP or get more info: 505-471-1290. Santa Fe's municipal election is set for Tuesday, March 2, 2010. Click for info on absentee, early in-person and election day voting. The Eight Northern Indian Pueblos Council Board of Governors voted unanimously to endorse Mayor David Coss at their meeting on February 16th, according to a statement released today. The Board of Governors represents the Pueblos of Tesuque, Pojoaque, Nambe, San Ildeffonso, Santa Clara, Ohkay Owingeh, Picuris and Taos. Mayor Coss has a proven track record for working well with tribal governments. He reached out to assure consultation on the Santa Fe Convention Center that resulted in a historic agreement between the Pueblo of Tesuque and the City of Santa Fe, according to his campaign. He also facilitated respectful consultations with Santa Domingo regarding commercial airline service at the Santa Fe Airport. Additionally, the Coss administration has worked with tribal government to resolve water issues and to assist San Ildefonso Pueblo with operations of its water treatment system. Click to see a list of organizations that have endorsed Mayor Coss. This is a guest blog by David Coss, who has been Mayor of Santa Fe since 2006 and is running for a second term. The election in Santa Fe is March 2nd. We must get Santa Feans, and New Mexicans, back to work. That is why I’ve come up with a blueprint for Santa Fe’s economy to create 4,000 jobs over 4 years. The blueprint targets a variety of sectors including affordable housing, education, media/film industry, health and technology, green energy/sustainability, public safety and infrastructure, and arts, cultures, and tourism. It’s going to take innovation, collaboration, and creativity; but I think we can do it. And I hope other Mayors do the same. Santa Fe, like the rest of the country, is being hit by recession that is resulting in hard budget choices and job loss. National trends of falling home prices, limping credit markets, and rising unemployment rates are equally plaguing Santa Fe. I’ve made Santa Fe’s economic recovery and job growth one of my top priorities. In 2009, with the City Council, we made $13 million in budget adjustments and tough belt-tightening to the City budget to adjust for falling gross receipt taxes, but prevented any layoffs, which would have added to the jobless rate and created distress for many Santa Fe families. On average, each $80,000 of investment into Santa Fe creates one job. To create 4,000 jobs in 4 years then, will require approximately a $320 million in investment into Santa Fe through multiple sources. This investment will come from a combination of existing city resources, federal stimulus funds, partnerships with other local governments, and the private sector. By using existing funds, leveraging other funds and building new partnerships, we can bring this investment to Santa Fe’s economy, without raising taxes. We must use today’s resources to position ourselves for tomorrow’s economy. It is important that we are pursuing alternative forms of energy to decrease electric bills, reduce the city’s carbon footprint, and help local businesses and home-owners to use solar energy and decrease electric bills. These initiatives have the capacity to create high paying, good jobs and reduce the city’s carbon footprint. We also want to retrofit homes with energy efficient materials and make water conservation cost-effective for local families. These are Santa Fe values. We can draw on them to revitalize the economy, innovate, and get Santa Feans back to work. A key component of our blueprint is helping local Santa Fe businesses to be ready to expand. That means capacity building for small businesses so they can grow smartly and sustainably, so that small local business have the capacity, for example, to bid for local contracts to be providers of alternative energy. Also key, is ensuring the types of good jobs that give young people interesting employment opportunities in Santa Fe – so they stay here, buy homes here, and contribute to our community and our local economy. Over the next several months I will be meeting with leaders in the proposed sectors to refine the blueprint and develop detailed plans to create jobs. There are opportunities that can be acted on immediately such as parks & trails and affordable housing initiatives, and plans that can be drawn to lay a strong foundation for future job growth that will benefit all Santa Feans and bolster our local economy. I welcome community input as we move this important initiative forward. We can revitalize Santa Fe’s economy, and New Mexico’s economy, together. This is a guest blog by Santa Fe Mayor David Coss. You can download "4,000 jobs in 4 years: A blueprint for our economy" at his campaign website. Many of the leading members of Santa Fe’s visual arts community will host a reception in support of Mayor David Coss on Thursday, February 11, 2010. Among the co-sponsors are 75 of the City’s top artists, gallery/business owners, curators and art publications The reception will take place from 5-7 PM at the LewAllen Gallery in the Railyard District. Completing and putting into operation the Railyard District, including the Railyard Park, Warehouse 21, new businesses and galleries, and the Farmers’ Market. Completing, in cooperation with the State, the Rail Runner, which brings hundreds of commuters and tourists to Santa Fe to work, shop in our stores, and eat in our restaurants. Purchasing the College of Santa Fe so that it would not be forced to close, then leasing part of the land to Laureate Education for the purpose of operating CSF. Giving the Santa Fe Complex a multi-year contract for innovation in cutting edge art and science projects. Beginning daily American Eagle Airlines jet flights between Santa Fe and Dallas/Fort Worth and between Santa Fe and Los Angeles. Creating and implementing the 2,500-square-foot, City-funded Convention Center Community Art Gallery, featuring local northern New Mexico artists. Santa Fe County Sheriff announced his endorsement of Mayor David Coss yesterday, citing his ability to bring people together to solve pressing issues in Santa Fe and reduce crime. Mayor Coss has worked with local law enforcement, community advocates, and neighborhood watches in Santa Fe to reduce crime. As a result, the number of police officers on the streets has increased by 24%, there are over 120 neighborhood watch groups, violent crime is at the lowest level in eight years, and burglaries have decreased by 57% over the last six months, according to Solano. Conservation Voters New Mexico and the Sierra Club, both prominent environmental advocacy organizations in Santa Fe and statewide, endorsed Mayor David Coss today. His reelection campaign said the endorsements underscore Coss’ strong and steady record on sustainability and environmental issues. “Mayor David Coss continues to be a champion for protecting the Santa Fe River and has worked to sustain Santa Fe’s water and clean energy future by tackling climate change at the local level,” said Sandy Buffett, Executive Director of CVNM, in a statement released today. Among other notable environmental accomplishments, Mayor Coss has championed the efforts to restore the Santa Fe River. The River, once on the verge of dying, now has a dedicated water flow from Memorial Day to Labor Day. Additionally Mayor Coss supports alternative forms of solar energy to decrease electric bills, reduce the city’s carbon footprint, and help local business and home-owners to use solar energy. Brought the Santa Fe River to life by dedicating water to the river from Memorial Day to Labor Day. Set aside part of its water rights to create a living river. Cleaned and restored the river bed. Converted the city’s residential building code to a “green building code,” the strongest in the country. Built our LEED Gold Certified Community Convention Center on time and under budget. As of August, the Center has already been booked for 44 out of 52 weekends in 2010. 23 national conventions and events alone will bring more than 20,000 visitors to our city. Formed a partnership with ¡YouthWorks! to help create jobs, clean up, plant, and stabilize the Santa Fe River and to weatherize individual homes. ¡YouthWorks! has helped over 100 young Santa Feans transform their lives. Supported and implemented City policies which have resulted in Santa Fe using less water than in 1994. Became the first U.S. city to formally adopt the 2030 Architecture Challenge, which sets timelines for buildings to be carbon-neutral by 2030. This means no fossil fuels will be used to heat, cool, or light City buildings by 2030. Established a City “Green Team” and refocused the Sustainable Santa Fe Commission to work on a solar access bill and a Sustainable Santa Fe plan. Signed contracts with SunEdison for 1.8 megawatts of solar electricity for the City. This will immediately lower the City’s electricity costs and reduce the City’s carbon footprint by 5%. Increased recycling to weekly pickup two years ago. About 100 tons more materials were recycled monthly in 2008 than in 2007. Completed automated garbage collection for 24,000 homes. Built the first new walking and biking trails within the City in a decade. The City is currently using another $10 million to build walking and biking trails, including the Santa Fe River Trail from downtown to Frenchy’s Park. Jose Garcia, an official of AFSCME Local 3999, announced today that Mayor David Coss has received its endorsement for reelection. AFSCME, with 700 members, is the City's largest union. "I'm extremely honored to be endorsed by the City workers," said Mayor Coss in a statement released today. "This election is about continuing our efforts to build a strong local economy with good jobs. No one knows these issues better than working families. I look forward to continuing to work with AFSCME to serve the people of Santa Fe in this difficult economic period." Mayor Coss said he's proud of the City's efforts to bring good paying jobs to Santa Fe, particularly jobs with health and pension benefits, as most union jobs provide. On Sunday, January 10, 2010 from 1 to 3 PM, the Re-elect Mayor David Coss campaign committee will celebrate the opening of its campaign office located at 4056 Cerrillos Road, Suite C-3 (across Rodeo Road near Santa Fe Place). Mayor Coss and his family will be present. The public is welcome to attend. Refreshments will be served.